If you’re the kind of person that likes to change that basic dress or blouse (or sweater) into a variety of styles just by adding a faux collar or bow collar, this tutorial is for you! This collar tutorial will be a “custom” collar that uses your basic blouse or dress pattern as the basis for making the collar. 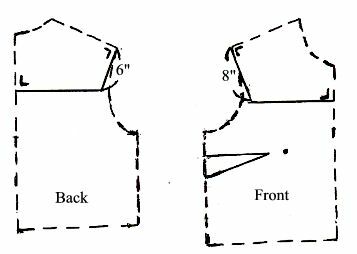 Beginning at the end of the shoulder line, (don’t go all the way to the end of the seam allowance — just the shoulder line) make a “square” as indicated in the above diagram, and draw a straight line 8″ long. At the end of the 8″ line, draw a straight line to the center front that will be “squared” to the center front (the line will be parallel to the waist line). 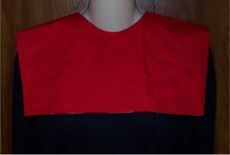 This piece is the front collar. Beginning at the end of the shoulder line, (don’t go all the way to the end of the seam allowance — just the shoulder line) make a “square” as shown above and draw a straight line 6″ long. At the end of the 6″ line, draw a straight line to the center back that will be “squared” to the center back line (the line will be parallel to the waist line). 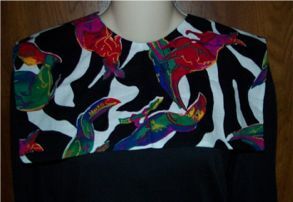 This piece is the back collar. Copy the two collar pieces just drawn onto pattern paper — they will need to be separate pieces, rather than cutting into your blouse or dress pattern. 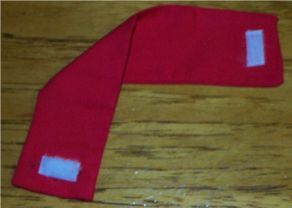 To complete the pattern, add 1/2″ seams all around, except the center front, which will be on the fold, as shown above. 1. Cut one front (center front on the fold) from the print fabric and the solid color fabric. Cut 2 back pieces from each fabric (print and solid). 2. Pin and sew the shoulder seams on the print fabric and on the solid fabric. 3. With right sides together, sew the two collar pieces together, leaving a 2″ area open along one of the center back seams so it can be turned. 4. Clip the curve around the neck before turning. 5. After turning the collar right sides out, press all the seams. Either hand stitch the opening closed or stick a small piece of stitch witchery inside and press closed. 6. Use a small piece of iron on velcro for the back neck closure (cut a piece approximately 1/4″ x 1/2″ and secure as in the following picture. Want to make a BOW COLLAR? Cut 2 strips of the solid or printed fabric 8″ long and 2 1/2″ side. With right sides together, using 1/2″ seams, sew the two long sides to make a tube. Turn right side out and fold the end seams to the inside, press and hand sew the end seams to finish the strip. 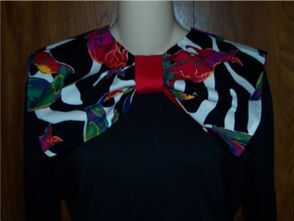 Place the finished strip at the center front collar to make a bow, as shown below. Dress up your favorite basic dress or blouse with an assortment of collars and bows. For a variety collar styles, see our pattern changing – collars class at the PatternsThatFitYou website. In addition to making a variety of collars, you may also want to make new necklines and new sleeve styles for that basic dress or blouse. 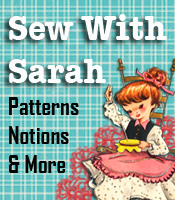 There are so many changes you can make to that one basic pattern, you may not need to buy another pattern. A few weeks ago we ran a post asking the question, “Who do you sew more for…… plus size/full figure women or overweight/obese children”? We have gotten a TON of emails from people answering that question and reasons WHY they do what they do. By far the MAJORITY of people responding say they sew for full figure/plus size women. Many of the reasons were basically the same – “I am a full figure woman, can’t find anything that fits properly, so I pretty much sew for myself, and help out a friend or two as well”. The book/class preferred by these women with the “I sew for myself” answer is the “Sewing For Full Figure/Plus Size Women as a Home Business” because that manual contains ALL of the classes plus additional information at a reduced price than if they were to purchase “some” of the classes now, and some more later. In reality, the idea of having all the information in one manual is more beneficial than many separate classes that they may “lose”. I would never have thought about that answer, as I figured the “business” manual would primarily for those in a sewing business – amazing! We did have some responders who are indeed in a sewing business, and because they themselves are in the plus size category, they prefer to sew for the same type of women, as opposed to working with overweight children. On the other hand, those who preferred the “Sewing For Plus Size Children as a Home Business” are ones like I would have been a few years ago – had grandchildren who were very much overweight and had some friends who also had grandchildren in the overweight/obese size ranges. These people also purchased the business manual because it contained ALL the size ranges for overweight boys/girls so the information they needed was in one manual regardless of whether the overweight child was 6 years old, 10 years old, boy or girl – everything was at their fingertips. 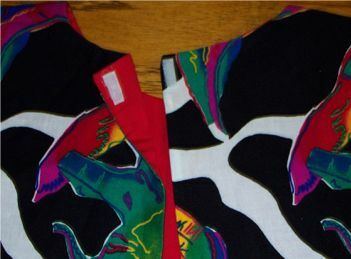 In addition, the business manual contained the information about how to alter store bought patterns for plus size children – so they figured they were all set regardless of who they were sewing for, what ages they were sewing for, or if they were making the patterns or starting with a store bought pattern and altering it. Regardless of whether you’re in a sewing business or sewing for just a few people, I’m sure one of the above books will help you in getting the perfect for that full figure woman or for those overweight children. Put some thought into the mood you want your booth to create, and identify the different colors that can help produce this mood. Be wary of overly bold colors or busy patterns. Remember, you want to choose colors that make your products pop! One way to draw people into your booth—even from afar—is by displaying your items at various lengths and depths. 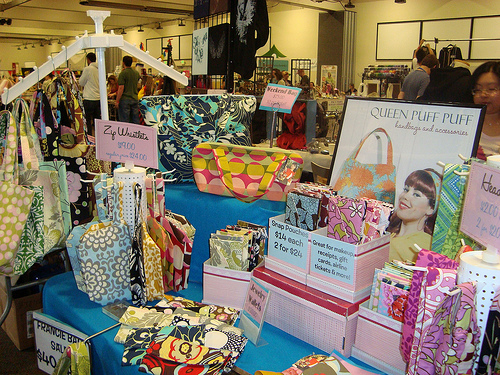 Keeping your items at varying heights will keep your booth interesting and inviting. It’s extremely important to have signage in your craft show booth. If you want people to remember you, make sure that you have a clear sign displaying your store or website name in a unique and interesting manner. You should also make it a point to clearly label each item with its price. Customers might be turned off if they have to ask for the price of every single item, and they might be even more upset if they cannot ask for your prices because you’re busy attending to another customer. Many shoppers will only decide on making a purchase after having time to think about it. It’s important to have business cards available containing all your contact information. You may also want to jot down the other craft shows you will be joining at the back of the business cards to make it even easier for these shoppers to find you. Keep your booth looking welcoming and orderly, and avoid going overboard. You may be tempted to go all out with your booth display—but remember that your product is the real star of the show. As cheesy as it may sounds, one of the most important things you can bring to a craft show is a cheerful disposition and a huge smile. Draw in those customers by being pleasant and engaging, and remember to have fun with the experience! Your well-being is about so much more than just being well – in addition to your physical and mental health, there is a sense of contentment that we get from connecting with our friends and family, and being connected to our community. When we're confident in our careers and feel good financially, that also adds to our well-being. Our own personal well-being is just that, personal, and that's why Humana has created the My Well-Being Assessment. The free online tool allows you to evaluate your health and wellness and well-being. Join the My Well-Being website and you'll receive a FREE Dummies book just for signing up. In addition to your choice of three free Dummies books, you'll find lots of great content like games, polls and tools plus all sorts of feature stories to help increase your well-being on topics like saving money while staying healthy, organizing your family, and the relationship between learning and earning. Evaluate your well-being today and get the tools you need to help you start improving it right away. Share your opinions with the community and stretch your mental muscles! Taking steps to improve your well-being will help you in all aspects of your life and My Well-Being makes that easy to do with content that is personalized for you.